Home » Our Doctors » Charles Turner, O.D. Dr. Charles J. Turner is a therapeutically licensed Optometrist, which allows him to treat eye infections and diseases of the eye, as well as prescribe glasses and contact lenses. Dr. Turner is Daniel Island ‘s first Optometrist, a distinction for which Dr. Turner and his office are very proud of. Dr. Turner graduated with a B.S. in Biology from Virginia Tech, and received his Doctor of Optometry degree from Indiana University. Dr. Turner completed internships at Keesler Air Force Base in Biloxi, MS, Montrose Veterans Hospital in Montrose, NY, Huntington Veterans Hospital in Huntington, WV, and IU School of Optometry in Bloomington, IN. Dr. Turner’s unique blend of internship experience has allowed him to treat premature infants through aging eyes in elderly adults. A big proponent of children’s care, Dr. Turner is a member of InfantSEE, which allows free eye exams for children under the age of 1, and routinely performs eye screenings at local academies and elementary schools. Dr. Turner has been a part of the ‘Adopt a Teacher’ program at the Daniel Island School since its inception, and now teaches eye dissection to three 8th grade science classes every year. At the other end of the spectrum, Dr. Turner also spent 5 years at local Charleston nursing homes, caring for elderly adults that are not able to leave the nursing home for optometric care. Dr. Turner’s top passions are Pediatric vision care and Contact Lenses. After only 6 years, In 2010, Island Eye Care and Dr. Turner became South Carolina’s largest Contact Lens Inventory Practice. Dr Turner has expanded his contact lens patient base, and receives referrals from the entire coast of SC, as well as North Carolina. In 2011, because of his passion and expertise with contact lenses, Dr. Turner was selected to join Johnson & Johnson’s contact lens division, as a professional speaker. Dr. Turner married the love of his life, Erin, on October 15th, 2011. Outside of the office, Dr Turner and Erin can be routinely seen running and cycling on Daniel Island, and enjoying the Charleston lifestyle on Sullivan’s Island and downtown Charleston. 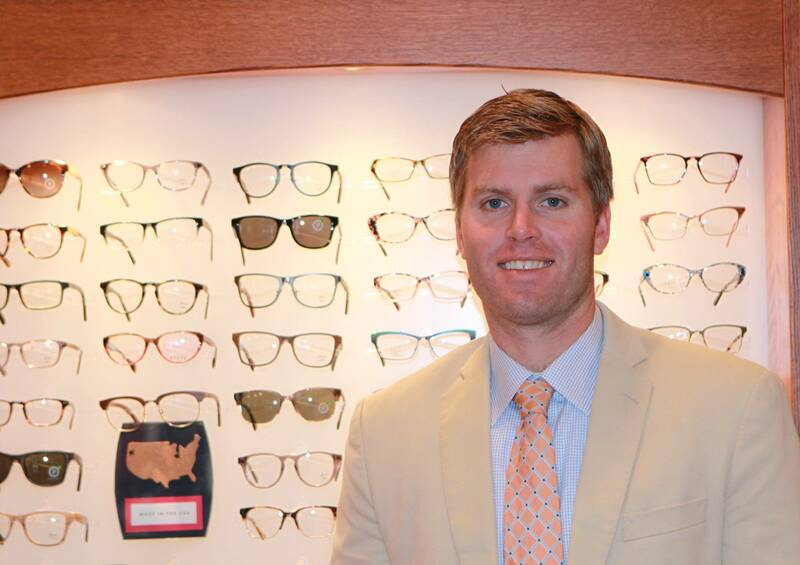 Dr. Turner is a member of the Daniel Island Business Association, member of the Charleston Chamber of Commerce, member of the South Carolina Optometric Association, member American Optometric Association, member of the Charleston Chapters of the Virginia Tech and Indiana Alumni Associations. Hometown: South Bend, IN…..but now, Charleston, SC. Favorite pair of Sunglasses: Oakley Jawbone with Transition lenses….Absolutely the perfect pair of Cycling Glasses, I love them. Football Season: Virginia Tech, Go Hokies! Hobbies: Triathlons during the summer, Football in the fall, Beach anytime. What’s playing on my iPod/music device: Pearl Jam. Have seen them in concert over 15 times. Musically, still stuck in the 90’s.